Tackling a Tough Topic at Your Next Conference? Consider Hosting Your Own Debate! There are many termsused todescribe the communication toolcalled “debate.” Depending on who you ask, you may hear debate referred to as disagreement, conversation, conflict or politicking. The ability to debate well and fairly is not innate, but rather must be learned and continually practiced. This is important to realize since most people dislike the feeling of being in conflict, which an unskilled debate pair or un-moderated debate session can evoke. When handled correctly, debate is an invaluable tool for resolving conflict. This is why a vigorous debate — in the right hands, at the right moment and for the right reasons — can be a powerful tool to facilitate a fair, open and productive discussion of even the toughest workplace topics. Roll call. During roll calleach debater is introduced, starting with his name, then listing his credentials and relevant background information. Agenda setting.For multi-topic debates, the agenda is introduced in order of topic and then, if applicable, a majority vote can ratify the agenda. Debate style. There are two styles of debate: formal and informal. A formal debate is typically moderated, with strict adherence to speaker order, commentary time, how opening remarks and closing comments are handled and whether a question-and-answer period will follow. An informal debate allows for conversation to flow freely between all participants. Close of session. Once the debate has concluded, the moderator or host closes out the session with a few remarks and voting instructions (if a vote is to be taken). The “name draw.” “Name” debaters or debate duos often draw a crowd that might not attend the debate otherwise. Exclude personal bias. Trained debaters know how to present both sides of even the most challenging issue without allowing personal bias or opinion to color the topic(s). Minimize confrontation.Professional motivational speakers trained in debate can handle confrontational questions from their fellow debater(s) and the greater audience without losing their cool. Maximize results. It is often easier to hear, absorb and accept difficult ideas when they come from someone who is not personally known inside the organization or network. Besides inviting professional debaters to present the topic to your audience, you may want to consider adding a trained moderator to the mix. 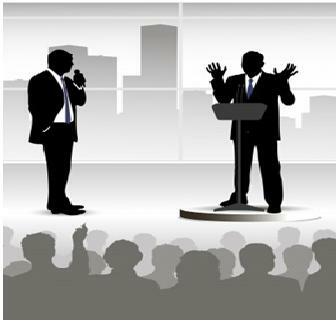 If you plan to allow an open-forum discussion that includes the greater participating audience following your debate, a trained moderator can be invaluable in minimizing “airtime hogs” (participants who repeatedly ask questions or want to argue), allowing for the most productive discussion, keeping to time (extended debate is exhausting and counterproductive to your goal) and ending the debate on a positive note. When implemented correctly, with the right presenters, at the right time and for the right reasons, debate is a powerful tool for introducing positive dialogue and forward motion into your organization. As well, debate helps each participant feel heard, understood and valued. About the Author: Marla Huang cut her teeth as a speaker while serving as president of her college debate team. After spending five years as a speaking coach to several well-known authors, Ms. Huang returned to academia to teach debate.